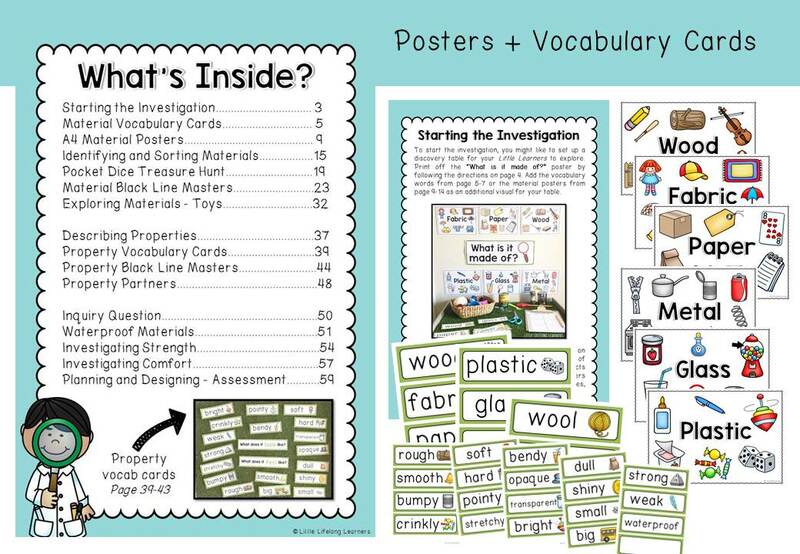 Explore the different materials that familiar objects are made of through hands-on explorations and printables! 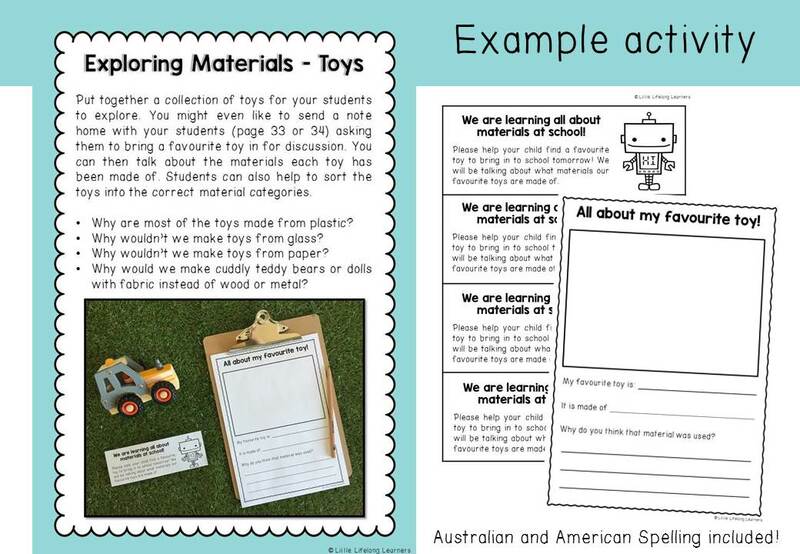 Teach your Prep and Kindergarten students about the chemistry strand of materials and their properties with this science unit! Explore the different materials that familiar objects are made of through hands-on explorations and complimentary printables. Save 20% by grabbing this unit as part of my bundle! 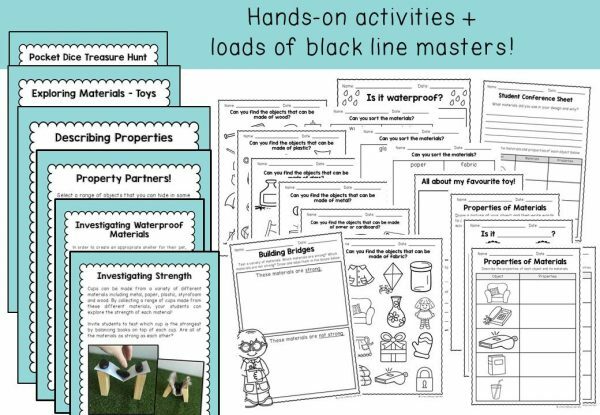 This packet includes 66 pages of suggested activities and matching black line masters. 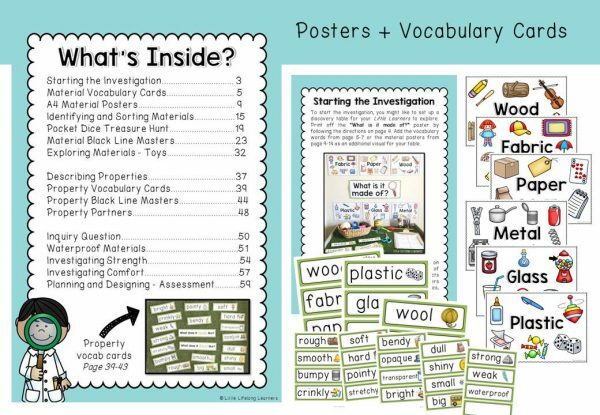 You will also find a variety of vocabulary posters, experiments, hands-on activities and lesson ideas to compliment your science movement unit! Assessment task using the inquiry question – Can you design a shelter for our new pet? The inquiry question “What is it made of?” will provide a wonderful basis for your science lessons. The assessment task at the end of the unit requires your little learners to design a shelter for a pet. This will provide an opportunity for your little learners to display their understanding of the key scientific concepts explored within the unit! While I design my resources with Australian Curriculum in mind, I include alternative US spelling too. Click here to see my other Science materials. Please note that this is a DIGITAL product and that no physical product will be delivered. You will be able to download the PDF file at any time by logging into your account after purchase.